This year we have created the Ultimate London Experience! Starting at a central London Pier we will meet you for your Ultimate London Experience, taking you on a journey high and low on a Turbo Challenge. This is specifically designed for a fantastic team build event or just simply to enjoy the summer weather in the capital. Combining three events, this experience is perfect for those who wish to experience London from a number of angles. There is no better way to explore England’s longest river and one of the most famous waterways in the world than on your very own high speed boat. As you power through the famous London waters you will witness the delights the capital has to offer on your way to the east of the city. 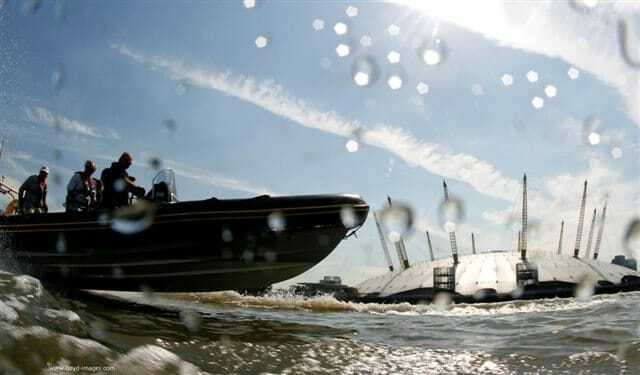 You will be the fastest on the Thames as you enjoy the wonders of the city from an angle not usually seen. This exhilarating start to your Ultimate London Experience is a memorable one, however your experience will continue to excite and thrill everyone. As you reach the east of the city, the world’s most up to date music, sports and entertainment venue is in striking distance. The 02 arena which opened its doors in 2007 has become one of Londons much loved iconic landmarks with its ever changing acts entertaining London from the specially designed arena area. One of the striking characteristics about the 02 is the unique shape it creates in the London Skyline. The dome like shape which rises 52 metres up from the ground offers a perfect opportunity to explore the city from a slightly higher view than usual. Offering unique and striking views of London up to 15 miles away, climbing the 02 is the second part of our unique and ultimate London experience. Armed with your climb suit, boots, safety equipment and an expert guide you will make your way to the specially designed platform at the highest point of the dome shaped landmark. Another great addition to this fantastic event is the opportunity to use a first class flight simulator. This simulator offers a state of the art experience for your group as you enjoy a thrilling and realistic flight in an Airbus 380 or Boeing B777. You gain control of the location, time of day and weather conditions for your simulated flight in a realistic flight experience. Our specially trained simulator instructors will guide and assist your team to victory as they attempt to explain what all the buttons and widgets are designed for in the cockpit before your team takes full control to see what it’s really like! 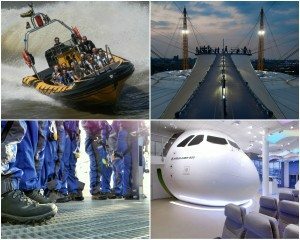 This is an unforgettable experience starting along the legendary River Thames and finishing in the cockpit of an Airbus 380 with a climb up one of Londons most iconic landmarks in between! If you are an adrenalin seeker or simply want to reach a new height when it comes to your team building or summer events in London this is perfect for any group. At Team Tactics we are also able to bespoke the event to any brief so if you want to swap any of our three turbo activities to an alternative we are on hand to help.